The Hawaii Department of Transportation is responsible to plan, design, construct, operate, and maintain State facilities in all modes of transportation, including air, water, and land. Coordination with other State, County, and Federal programs is maintained in order to achieve these objectives. To provide a safe, efficient, accessible, and sustainable inter-modal transportation system that ensures the mobility of people and goods, and enhances and/or preserves economic prosperity and the quality of life. View all state highways program data including current & future projects scheduled to begin in the next two years. Available data also includes Average Annual Daily Traffic counts and pavement conditions for state routes. We are including the year-to-date traffic fatality figures by county on our Safe Communities page to raise awareness. This will be updated weekly. HDOT crews continue working as quickly as possible to clear and repair Kuhio Highway on Kauai’s North Shore following historic flooding that begin April 14, 2018. Limited single lane access on Kuhio Highway is currently available to local residents, emergency responders, and approved permittees at designated times. Access through the restricted area of Kuhio Highway remains prohibited to visitors and vacation rental customers in the Wainiha and Haena areas until the highway is reopened to all traffic without escorted convoys. We thank everyone involved for their patience and kokua as we safely work to restore normalcy for all impacted. HDOT has partnered with the USDOT Central Federal Lands Highways Division (CFLHD) to deliver ten bridge and other highway improvement projects throughout the islands. For additional details on each of these improvement projects click here. DOT’s presentations from recent community meetings statewide are now available. Click on the link above to see what projects are planned in your area. Legal presence requirements affect anyone applying for a Hawaii driver’s license, including U.S. citizens and foreign-born applicants, those applying for a learner’s permit, and permit holders passing their road test to obtain a driver’s license. Legal presence also applies to anyone who has just moved to Hawaii from another state or country, and anyone renewing their Hawaii driver’s license or permit. Want to check the traffic before you leave home or work? 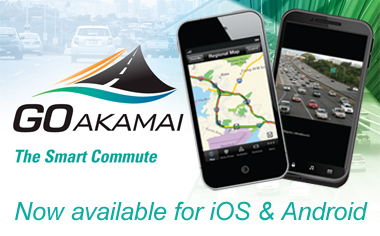 Use GoAkamai.org to see the current conditions on Oahu's freeways and highways. Now available for iOS and Android devices. Our Storm Water Management Plan aims to mitigate degraded stormwater runoff quality that may be caused by industrial activities at our state airport, harbor and highway facilities. Click here to find out how. HDOT has partnered with the USDOT Central Federal Lands Highways Division (CFLHD) to deliver ten bridge and other highway projects throughout the islands. Click here for more details.